The assistant celebrated wildly in front of the Red Devils boss after the Blues had equalised, and he has now been punished. 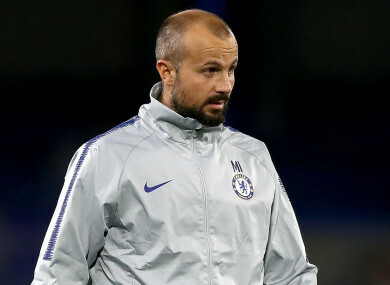 CHELSEA COACH MARCO Ianni has been fined £6,000 by the English Football Association following his touchline clash with Manchester United manager Jose Mourinho. Ross Barkley’s stoppage-time goal in the 2-2 draw with United on October 20 sparked a melee involving Ianni, Mourinho and Stamford Bridge stewards. Ianni celebrated wildly in front of the seated United boss, prompting Mourinho to react furiously and try to confront him at the entrance to the tunnel. The former Napoli assistant coach was charged with improper conduct and the FA confirmed on Tuesday that he has accepted the sanction. Mourinho had called for leniency to be shown towards Ianni after accepting an apology from him and Chelsea head coach Maurizio Sarri. “I don’t think he deserves more than what he got,” Mourinho said. “He apologised to me, I accept his apologies. I think he deserves a second chance. I don’t think he deserves to be sacked. I don’t think he deserves anything more than the fact his club was strong with him. “I hope everybody does the same as I did, which is not to disturb the career of a young guy. Probably, he is a great guy, a coach with great potential. Email “Chelsea coach Ianni fined £6,000 after touchline clash with Mourinho”. Feedback on “Chelsea coach Ianni fined £6,000 after touchline clash with Mourinho”.